The saga of would-be world-beater electric car startup Faraday Future got weirder than usual this week, and this evening it escalated further. Just hours after FF’s ex-chief financial officer Stefan Krause confirmed he quit in October, the startup publicly accused him of “malfeasance” in a bizarre statement and claimed it’s pursuing legal action against him. Jalopnik first reported on Friday that Krause tendered his resignation in mid-October. Hours later, Faraday’s main financier—Chinese tech entrepreneur Jia Yueting—told employees in an internal email that it was planning to go public with a statement that announced the “termination” of Krause. Faraday held a meeting at 5 p.m. to discuss Krause’s “wrong doings [sic] and the damage on the company in the last several months,” the email, obtained by Jalopnik, says. 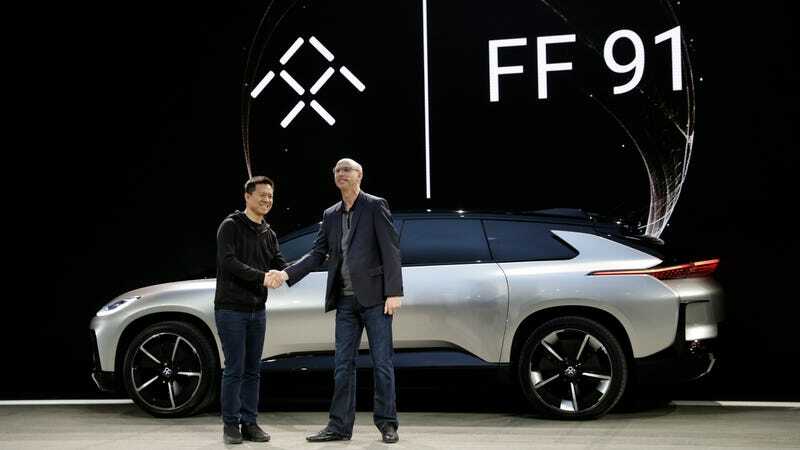 “I know we have a dedicated team of more than 1,000 employees globally who continue every day, despite challenging head winds [sic] and disbelievers, to push forward with our goal of bringing FF 91 to market,” Jia said in the email. Needless to say, such a move is all but unprecedented among automakers, and American startups as well. Most companies are tight-lipped about departures and legal actions, but Jia is basically swearing vengeance against Krause and others here. The email included a copy of a press release issued later Friday on Krause’s departure. The statement says—hours after Krause confirmed he tendered his resignation, effective immediately, on Oct. 14—that Faraday had decided to “terminate” him, effective immediately. The alleged “possible violation of law” is not specified. Krause, a 30-year veteran in finance executive positions at BMW and Deutsche Bank, joined Faraday in March, with the main task of courting new investors and raising $1 billion for the startup. In a statement, Krause said Faraday’s remarks “falsely” describe his departure from the company. Faraday’s statement accused Krause of taking unspecified actions that hindered the company’s fundraising efforts. “FF will continue our full efforts in expediting the fundraising process,” the statement said. But multiple sources have told Jalopnik that Krause has managed to bring investors to the table with serious offers this year, but they were contingent on Jia Yueting relinquishing control of the company. So far, sources said, Jia has refused to step aside. The startup abandoned a plan this summer for a proposed $1 billion factory in Nevada, but Faraday says it still aims to launch production of its electric autonomous car, the FF 91, in 2018. As of mid-Friday, state and federal court records didn’t reflect any newly-filed litigation against Krause. The company says in the statement that Pascal Coustar, ‎Faraday’s senior director of accounting and finance, will temporarily lead Faraday’s financial operations. Separately, the company announced that it was terminating its chief technology officer, former BMW exec Ulrich Kranz, who joined the company in July. But The Verge reported earlier today that Kranz, too, resigned from Faraday in recent weeks. Faraday’s entire press release is below. Faraday Future (FF) announced today its decision to terminate the employment of Stefan Krause as the company’s Chief Financial officer effective immediately. Stefan Krause’s possible violation of law and lack of contribution to FF’s goals over the course of his leadership since March has led to severe damages to the interests of FF and its investor. FF is currently taking legal actions as a result of Stefan Krause’s malfeasance and dereliction of duty. Pascal Coustar will temporarily lead the operations of FF’s financial management. Terminating the employment of Stefan Krause was a result of his actions in hindering FF’s fundraising efforts. FF will continue our full efforts in expediting the fundraising process. Further, the employment has been terminated effective immediately with Ulrich Kranz as FF’s Chief Technology Officer. Ulrich Kranz has only been appointed in this role for over three months and hist termination wouldn’t affect the R&D process and product development at FF. Since its establishment four years ago, Faraday Future as recruited and cultivated world-class research & development and management teams, mastered industry-leading proprietary technology, and created revolutionary products. Going forward, Faraday Future, together with all our employees and partners, will stay committed to our goal of revolutionizing the automobile industry by creating a next-generation smart and Internet-based mobility ecosystem and bringing unique values to our users.